Newly elected President Hayes is enjoying his first day in office when he is briefed by General Maynard, the Chairman of the Joint Chiefs of Staff, and learns for the first time of the existence of the Stargate Program. Immediately he confronts Kinsey, now his vice president, furious that his own running mate hadn't shared the information with him. 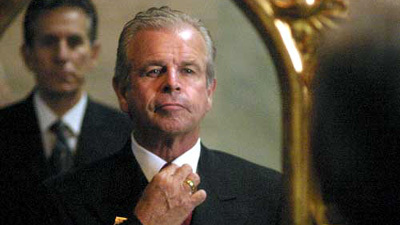 Kinsey, however, shares instead his determination to remove Hammond and SG-1, and take control of the SGC. It's a decision that the president needs time to consider, and he meets with Kinsey, Maynard, and Woolsey, who has completed his investigation of the SGC, to hear their evidence. As Woolsey presents evidence of poor judgment and misconduct at the SGC, and Kinsey cites incidents of insubordination and alien influence, Maynard strongly defends the men and women of the SGC as heroes. In fact, Maynard insists, with the rise of Anubis and his powerful new warriors, Earth's best hope is to allow SG-1 to do their job and save the planet once more. President Hayes is suspicious of the motivations and shady connections of his running mate, but he is also keenly aware of the political implications of the situation. Even as the Commander in Chief, he may not be able to protect SG-1. Woolsey begins to have concerns about the sinister liaisons of the vice president, and he returns to the SGC to meet with Hammond. He believes that Hammond's abrupt retirement and return to duty three years earlier suggests blackmail, and that evidence must exist of Kinsey's nefarious connections. Hammond considers carefully, then passes him a copy of the computer disk containing incriminating evidence against Kinsey that O'Neill and Maybourne had retrieved from Kinsey's computer. Returning to Washington, Woolsey delivers the computer disk to President Hayes, hoping that one day history will show that he tried to do the right thing. There is reason to believe that the rogue element within the NID has not been entirely eliminated and may be stronger than ever. At the time of the assassination attempt on Kinsey, something made him a liability, but afterward, a reconciliation presented the opportunity to propel Kinsey onto the presidential ticket with the promise of the full control of the Stargate Program that the White House affords. The disk of evidence against Kinsey which Maybourne and O’Neill retrieved from Kinsey’s computer and turned over to Hammond, has been turned over to Woolsey, and to President Hayes. Senator, now Vice President, Kinsey’s first name is Robert. Hammond is a 30-year veteran of the US Air Force.